Winter inspired holiday menus have been crafted with a focus on seasonal ingredients and celebratory indulgence to be enjoyed with family and friends. Highlights from the specially crafted four-course Christmas menu include: an elegant yellow fin tartar and kaffir coconut sorbet with white soy and nasturtium; butter poached lobster, potato gnocchi, wild mushroom, and lobster emulsion; Alberta ribeye, smoked brassica, brown butter potato, leek, bordelaise and bacon-wrapped pheasant terrine, caramelized parsnip, brussel sprout, Asian pear and black truffle. This menu will be available fromDecember 23 to 30 for $100 per person. Eat, drink and be merry with friends and co-workers at Hawksworth’s Cocktail Bar and enjoy playful rum cocktails with tropical punches for toasty “Christmas-like” flavours this yuletide season. Sip a specially crafted Night Moves cocktail, which offers a kick of classic holiday spices such as cinnamon, nutmeg, and vanilla with a hint of browned butter whilst tucking into flavoursome bar food plates. Ring in 2015 with Hawksworth Restaurant’s New Year’s Eve six-course menu for $150 per person. Start with an amuse bouche of smoked sturgeon, northern divine caviar, egg and dill -followed by six beautifully selected courses. For those celebratory toasts, choose from an extensive list of over 40 bottles of champagne and sparking wine, including a number of unique vintage selections. 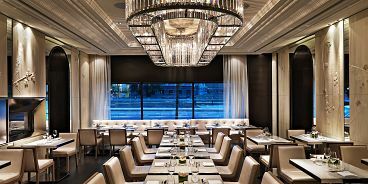 Hawksworth Restaurant is also available for lunch and dinner holiday party bookings in its elegant York Room or Bel Private Dining Room. For special occasions at home, small or large, the Hawksworthcatering team is able to take care of all aspects; from canapés to the clean-up this festive season. Hawksworth Restaurant will be open nightly for dinner as well as slightly modified hours for breakfast, brunch and lunch during the entire holiday period. For the full holiday hours or for reservations, which are highly recommended, please call 604-673-7000 or visit www.hawksworthrestaurant.com.